Date for 2015 NERFU Cup Set! The 2015 NERFU Cup will be held on May 2nd and 3rd in Newport, RI. The tournament is being held a little early than usual due to a conflict with the Volvo Ocean Race taking over Newport from May 5th to the 17th. 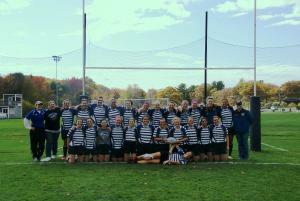 New England College Rugby and NSCRO would like to welcome you to the 2014 Northeast Regional Championship (NRC). The NRC will be played on November 22-23rd at NEC in Henniker NH. The winner qualifies for the Champions Cup National Championship on April 25-26, 2015 at Infinity Park, Glendale, C.. 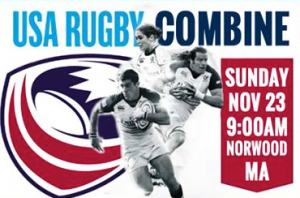 Mystic River will be hosting a USA Rugby Combine on November 23rd at Velocity Sports Performance in Norwood, MA. The combine is intended to identify elite athletes who could crossover into the game of rugby. 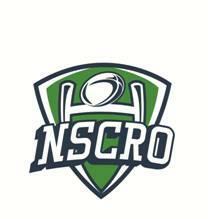 Exceptional athletes may be considered for invitation to USA Rugby High Performance camps an..
Keene State College hosted the 2014 NSCRO Region 1 Championships on November 9th and 10th. NERFU runner-up Franklin Pierce University faced a hard running Tri-State Conference Champ in Sacred Heart and lost 63-24 in the first semifinal. 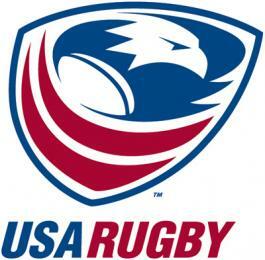 In the other semi-final NERFU Champions, the University of New..
Catch the All Blacks v USA Match this Afternoon! It's here! 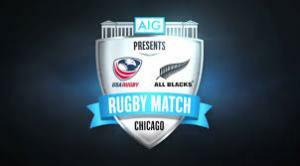 USA v New Zealand at sold-out Soldier Field in Chicago! (And it's snowing- check out the pic of Sonny Bill Williams looking a bit chilly)Hope everyone has plans to watch the game. Here's a list of NERFU clubs who've shared where they will watching the game (from east to west). Come out an.. The All Blacks are coming and we have two announcements surrounding the event to fill you in on. One is the watch party set up by the Mystic River Club for the Boston area. The other comes from USA Rugby who are looking for clubs to host player combines surrounding the match.The OFFICIAL watch party..
A USA Rugby Level 200 Coaching Certification Course will be hosted by New Haven Rugby on Sunday November 16th.Clinic DescriptionAll contact teams require an active Level 200 Coach to be in compliance with USA Rugby.The Level 200 Coach Certification consists of online pre-course work and attendance a..
Rugby Coaching Connection LLC is pleased to be able to offer a unique opportunity to players and coaches in the Boston area this November. 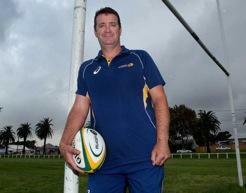 Damien Hill, the Australian Rugby Union National Kicking Coach, will conduct a Kicking Clinic to be held at Pine Banks rugby..
Boston Women's RFC is hosting a skills clinic for local women college and U19 players this Wednesday October 15th at 7:30pm. 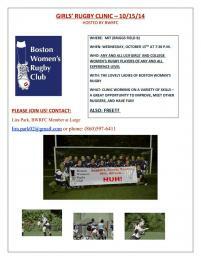 The clinic is free and players of all skill levels are welcome to join. We will have several different stations and cover a variety of essential rugby..
Six weeks into the NERFU 2014 Fall Season and the hunt for play-off spots intensifies... especially in the Men's and Women's Club Division 2. Only three points in the standings separates the top four clubs in Men's D2 (New Haven, Worcester, Mystic D2 and Newport). In Women's D2 just one point separa..